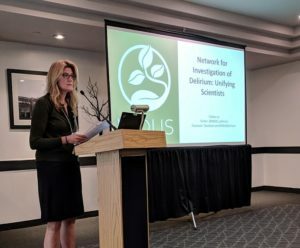 The 5th Annual Delirium Boot Camp was held from Nov. 1-3, 2017, in Boston, MA. The event was chaired by NIDUS Mentorship Task Force Leader Donna Fick, PhD, MSN, of Pennsylvania State University, and Co-Leader Wes Ely, MD, MPH, of Vanderbilt University. 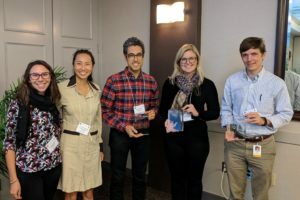 20 participants from around the U.S., Canada, Brazil and Australia attended, representing many research backgrounds including anesthesiology, geriatrics, intensive care, neurology, nursing, palliative care, pediatrics and surgery. The Boot Camp included 8 didactic lectures on a range of topics relevant to delirium research. Luci Roberts, PhD, Program Officer at the National Institute on Aging, also gave a talk on her advice for early-stage investigators, which was a highlight of the event. In addition to didactic sessions, the Boot Camp included a mock grant review session where participants, Boot Camp Junior Faculty and Faculty reviewed mock proposals in the style of an NIH Study Section, and an interactive CAM and 3D-CAM training session. We have provided slides and audio recordings (when available) from the Boot Camp below.